​UPDATE MARCH 2019: DUE TO THE HIGH VOLUME OF REQUESTS WE RECEIVE, WE NO LONGER ACCEPT INQUIRIES OR ORDERS VIA EMAIL. PLEASE STOP BY OR CALL THE BAKERY (630) 797.5350 DURING NORMAL BUSINESS HOURS - TUESDAY THROUGH SATURDAY 10AM-5PM - FOR PRICING & ASSISTANCE WITH PLACING A SPECIAL ORDER. ORDERS ARE NOT CONSIDERED PLACED/CONFIRMED ON OUR CALENDAR UNTIL FULL PAYMENT IS RECEIVED. THANK YOU! We also require at least a (1-2) week advance notice for all special order requests - unless our max capacity for that day has already been met. Changes or cancellations to any order must be made at least (3-5) business days in advance. Please see our full cancellation/refund policy HERE. We appreciate your understanding! 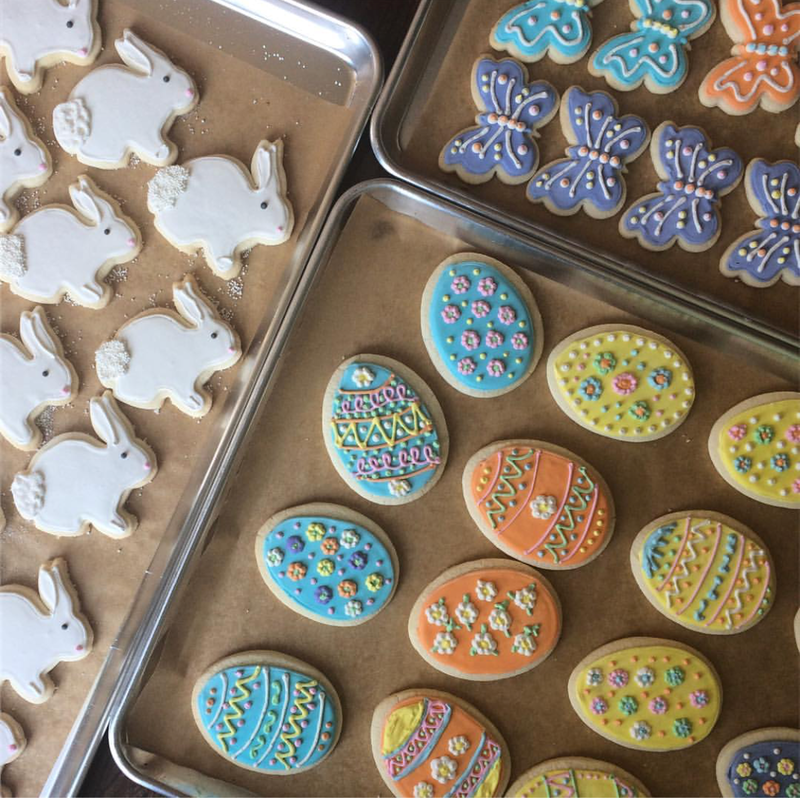 From a focal point of a special celebration to take-home favors, our artistic, hand-decorated SUGAR COOKIES are a unique and special way to customize your next gathering. We offer a variety of seasonal shapes and will even special-order a shape when possible. PRICING: $3-$5/each plus tax (on average); Shape/Size and intricacy of design may affect this pricing. PACKAGING: Individual packaging available for additional $0.25 per cookie; includes cellophane baggie and custom color ribbon. We do NOT use dark or bright colored food dye other than for the purpose of outlining/writing on cookies. We do NOT use fondant, edible images or overlays. While we will gladly use a photo found on the internet as inspiration, we will NOT directly copy a design. We do NOT accept outside recipes or requests to interpret recipes that are not our own. We are also not able to alter the ingredients in our recipes to suit low-carb, low-sugar or other allergy-restricted diets.